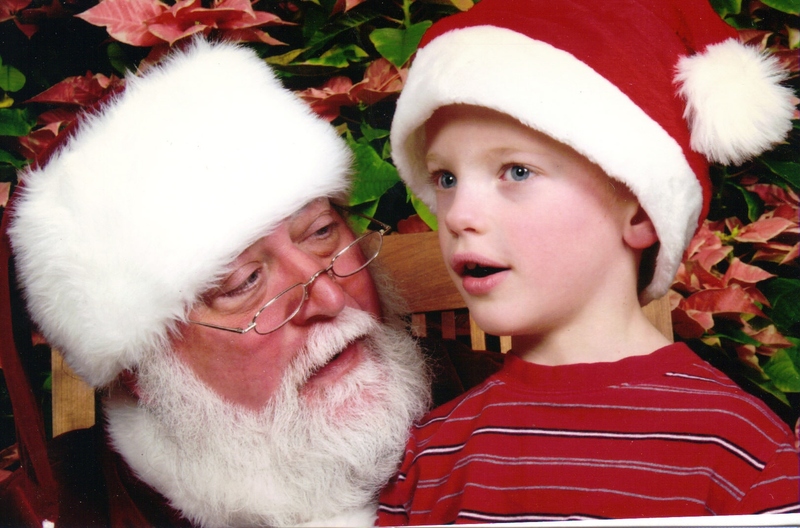 The Sunday before Christmas found me in a shopping mall in Rochester, Minnesota, waiting in line with my grandson Felix, aged two, to have a picture taken with Santa. We were there with his mom (my daughter) and his dad, and my wife Amy, plus my sons Will and Sam – Felix’s eighteen and fifteen year old uncles, respectively. The line was moving efficiently, there were enough of us to rotate on keeping Felix occupied, so there were no issues there. 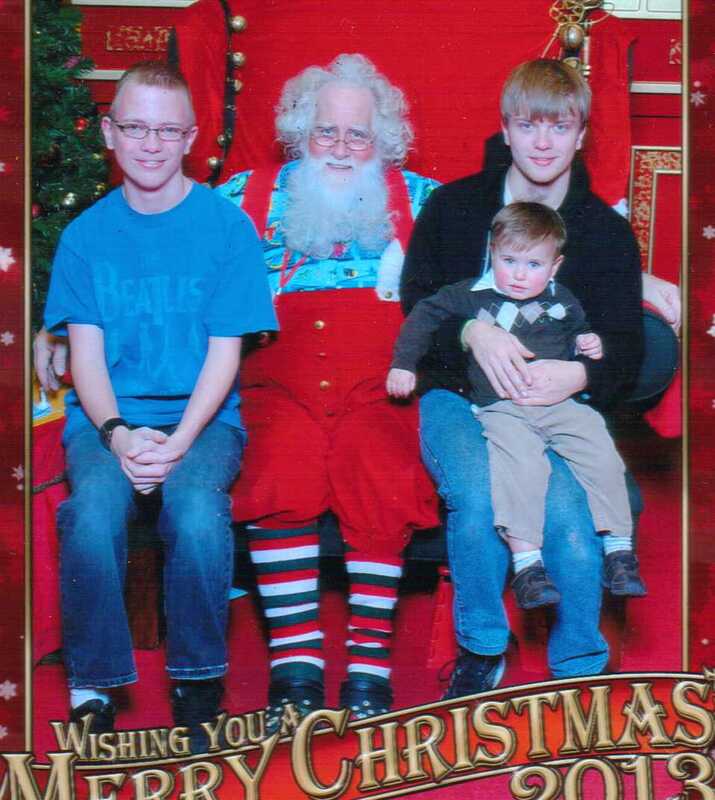 The idea was that Felix would do a solo picture with Santa, and then we would have a shot with Felix and St. Nick joined by Will and Sam. Felix wasn’t all that interested, and out-of-camera-range cajoling wasn’t getting it done. decided to go the Felix as a solo route. He still wasn’t thrilled, so his mom had to join the shot, much to her chagrin. It was a fun time for me, watching the various interactions; daughter, sons, grandson, all trying to get a picture or two taken. Pretty cool stuff, and I’m a guy who knows kid and grandkid cool. And really great Santa pictures. 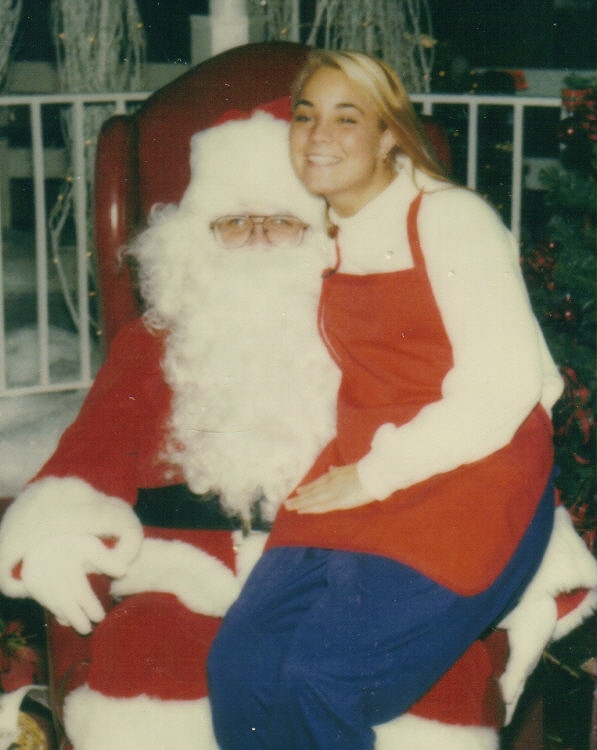 Nearly twenty years ago, I decided to pick up a few extra holiday dollars by taking a part-time job as a shopping mall Santa…. As I was neither the natural size nor age (nor naturally hirsute enough) for the role, I wore a roll of foam rubber beneath my suit, scratchy, silver nylon beard on my chin, and ended up working mostly the mall’s lower-traffic hours. On a very quiet Wednesday afternoon in early December, I was sitting there in my big Santa chair chatting with my college-student, elf-for-the-day Susie, and grad-school photographer, Jen. We hadn’t taken a picture in an hour. 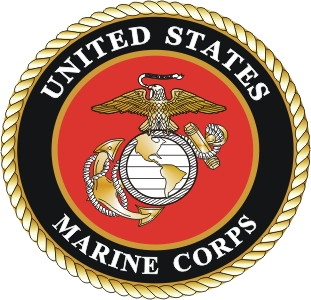 As we talked about school stuff, I looked down the nearly deserted mall and saw a tall, young U.S. Marine, in full dress blues; along side of him was a petite, middle-aged woman; unique, but certainly not the most unusual sight at Brookdale Mall during the holidays. Until it was obvious they were headed straight to us. Elf Susie walked cheerfully back to the gate of Santa Land to greet the couple, and I straightened up in my throne and smoothed out my beard – although I wasn’t sure why as I didn’t see any kids with the woman and the Marine. I watched as the boyish Leatherneck glanced around nervously, while the woman spoke to Susie. Their story was short, sweet, uncomplicated…unless, I suppose, you’re a self-conscious, twenty-year old Marine being asked to take a picture with Santa. The young man was an only child, U.S.M.C. Corporal home on leave; his widowed mother was very proud of his recent accomplishments, which included a marksmanship award, three ribbons and a training award. Having her son home for the holidays was a huge thrill, and there was only one other thing in the world she wanted for Christmas: pictures of her son in full dress blues. He told me had no idea why this particular setting was so important to her, but it was. So there we were on a suddenly interesting Wednesday afternoon: Santa and the Marine. Keep in mind that this was in the days before digital photography; our pictures were the time-consuming, one-shot-at-a time, Polaroid-you-wait-to-develop-then-stick-in-a-cardboard-frame variety – and the young man’s mother wanted nine of them to send out to relatives all over the country. The young Marine and I had some time to get acquainted. My arm around his waist, the young Marine sat uncomfortably but patiently at attention on the arm of Santa’s throne, glancing around nervously. After the first picture was snapped, he staged whispered to me, sitting ram-rod straight while staring directly at the camera, “I’m really sorry about this, sir.” I smiled and chuckled, as much as being referred to by a Marine as ‘Sir’ as the situation itself. 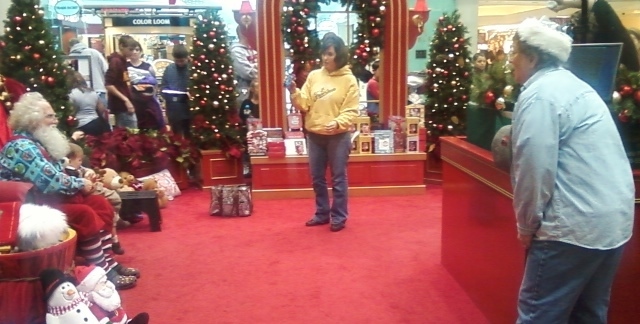 “Ho-ho-ho!” I replied, as Jen readied the next shot. 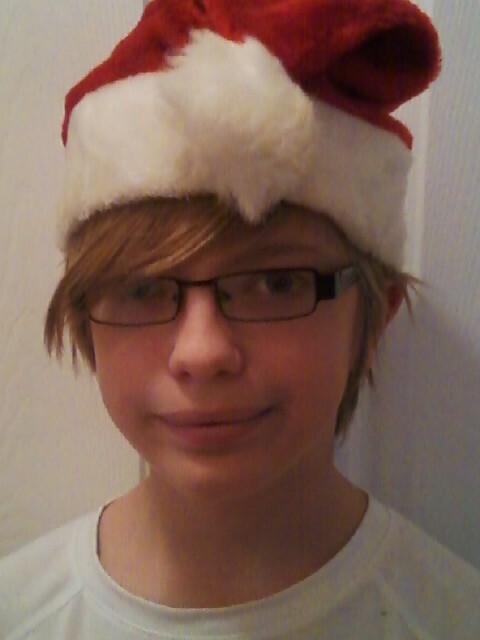 “Sorry about what?” I asked, as sympathetically Santa-like as I could. The scene continued to play out, the Marine finally getting comfortable enough to relax and lean into my shoulder a little bit, as Jen continued to focus and shoot, reminding us repeatedly to smile – which the Marine did only slightly less uncomfortably with each shot. We sat there, his mother beaming with pride while chatting with Susie the Elf, me ho-ho-ho-ing it up and trying to help the guy out a little. After a few shots, I whispered to the young Marine, “O.K., I know this feels silly, but it’s making your mom really happy.” I nodded forward while Jen readied another shot. My favorite Jarhead glanced at his mother, smiled slightly. “Yes, sir” he replied, the nervousness softening in his voice. He was loosening up a bit, though that was being countered as by a small crowd that had gathered, eyes wide, buzzing with curiosity. I guess it’s not every Christmas you see a Marine in full dress blues sitting on Santa’s lap. The Marine smiled self-consciously as it dawned on me what the real issue might be. I made more Santa-and-client small-talk while Jen snapped away. “Grow up around here? Afraid you’re going to see somebody you know?” I inquired. I nodded acknowledgement of his predicament, ho-ho-hoed some more, asked him a few more questions, reminded him a couple more times about how his mother was smiling, talked Vikings football with the young man, tried not to add to his self-consciousness by chuckling at the situation, while Jen finished getting all of the pictures to the mom’s satisfaction. It took us fourteen shots to get the nine pictures the Marine’s mom wanted (I saved a couple of the botched extras; they were wonderful.) As his mom was paying Jen for the pictures, and newly Marine-smitten Susie finished sliding each picture into its candy-cane-and-reindeer-motif cardboard frame, the young Marine stood up, turned toward me, started to salute but then stuck out his hand to shake mine warmly. “Thank you, Santa…sir.” I believe that was proper-holiday-protocol-Marine-speak. His nervousness gone, he wore a proud, Marine-on-duty, restrained smile. Then, bag of Santa pictures in hand, proud mother and dutiful, loving son walked off, arm-in-arm back down the mall, as the smiling crowd parted, then quickly dispersed. In the years since, I’ve gotten the opportunity to tell this story to a number of Marines. Younger Jarheads tend to look at me quizzically, apparently pondering the obvious ‘what ifs.’ Older Corpsmen mostly nod, smiling proudly. A few have welled up hearing the story. As for me, every year the question comes up in conversation: ‘What’s the best Christmas present you ever got?’ That question is impossible for me to answer, but the story I can tell about one of the best Christmas presents I ever had a (small) part in giving? That’s a gift that fell right into my lap. 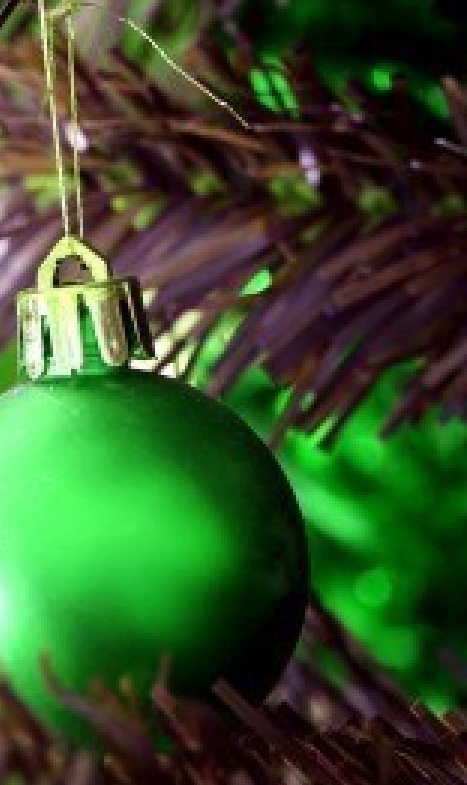 Pulled from the musty and cluttered Marchives; a favorite Christmas tale I told last year to good response. I hope you enjoy it – again, or for the first time. 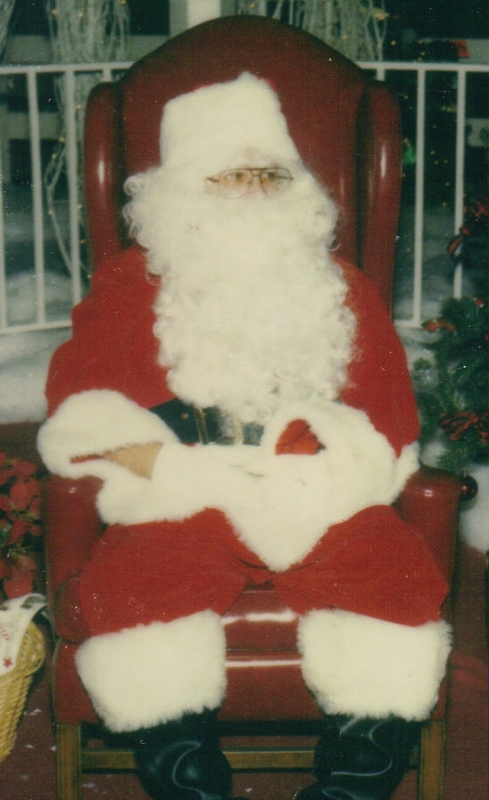 About 15 years ago, I decided to pick up a few extra holiday dollars by taking a part-time job as a shopping mall Santa. As I was neither the natural size nor age (nor naturally hirsute enough) for the role, I wore a roll of foam rubber beneath my suit, scratchy, silver nylon beard on my chin, and ended up working mostly the mall’s lower-traffic hours. On a very quiet Wednesday afternoon in early December, I was sitting there in my big Santa chair chatting with my college-student, elf-for-the-day Susie, and grad-school photographer, Jen. We hadn’t taken a picture in an hour or so. 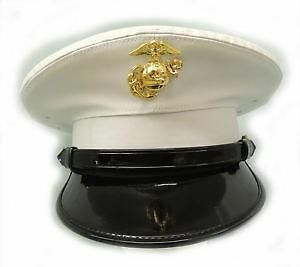 As we chatted about school stuff, I looked down the nearly deserted mall and saw a tall, young U.S. Marine, in full dress blues; along side of him was a petite, middle-aged woman; unique, but certainly not the most unusual sight at Brookdale Mall during the holidays. Elf Susie walked cheerfully back to the gate of Santa Land to greet the pair, and I straightened up in my throne and smoothed out my beard – although I wasn’t sure why as I didn’t see any kids with the woman and the Marine. I watched as the boyish Leatherneck glanced around nervously, while the woman spoke to Susie. Their story was short, sweet, uncomplicated…unless, I suppose, you’re a self-conscious, twenty-year old Marine. He had no idea why this particular setting was so important to her, but it was. So there we were on a suddenly interesting Wednesday afternoon: Santa and the Marine. Keep in mind that this was in the days before digital photography; our pictures were the time-consuming, one-shot-at-a time, Polaroid-you-wait-to-develop-then-stick-in-a-cardboard-frame variety – and the young man’s mother wanted nine of them to send out to relatives all over the country. The Marine and I had some time to get acquainted. My arm around his waist, the young Marine sat uncomfortably but patiently at attention on the arm of Santa’s throne, glancing around nervously. After the first picture was snapped, he staged whispered to me, sitting ram-rod straight while staring directly at the camera, “I’m really sorry about this, sir.” I smiled, as much as being referred to by a Marine as ‘Sir’ as the situation itself, and quietly chuckled “ho-ho-ho” as Jen readied the next shot. After a few shots, I whispered to the young Marine, “O.K., I know this feels silly, but it’s making your mom really happy.” I nodded forward while Jen readied another shot. My favorite Jarhead glanced at his mother, smiled slightly. “Yes, sir.” he replied, a hint of nervousness in his voice. He was loosening up a bit, though that was countered as by now as a small crowd was gathering, eyes wide, buzzing with curiosity. I guess it’s not every day you see a Marine in full dress blues sitting on Santa’s lap. The Marine smiled self-consciously. I made more Santa-and-client small-talk while Jen snapped away. “Grow up around here? Afraid you’re going to see somebody you know?” I inquired. I nodded acknowledgement of his predicament, ho-ho-hoed some more, asked him a few more questions, reminded him a couple more times about how his mother was smiling, talked Vikings football with the young man, tried not to chuckle at the situation, while Jen finished getting all of the pictures to the mom’s satisfaction. It took us fourteen shots to get the nine pictures the Marine’s mom wanted (I saved a couple of the botched extras; they were wonderful.) As his mom was paying Jen for the pictures, and newly Marine-smitten Susie finished sliding each picture into its candy-cane-and-reindeer-motif cardboard frame, the young Marine stood up, turned toward me, started to salute but then stuck out his hand to shake mine. “Thank you, Santa…sir.” he said in what I think was proper-holiday-protocol-Marine-speak. He wore a proud, Marine-on-duty, restrained smile. In the years since, I’ve gotten the opportunity to tell this story to a few Marines. Younger Jarheads tend to look at me quizzically, apparently pondering the obvious ‘what ifs.’ Older Corpsmen mostly nod, smiling proudly. A few have welled up he aring the story. Most have agreed it’s a pretty good, unique take on ‘Semper Fi’. As for me, every year around this time I read newspaper or magazine articles, or the question comes up in conversation: ‘what’s the best Christmas present you ever got?’ That question is not nearly so memorable to me as the story I can tell about one of the best Christmas presents I ever had a (small) part in giving. Yes, Felix – there is a Santa Claus. Or in the case of the Family Lucker, there are numerous Santas. 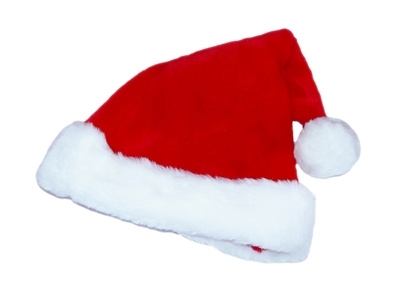 Not to mention a pervasive spirit of Santa Claus and what he represents. In the late 1800’s, a young girl named Virginia wrote to New York newspaper editor Francis Church asking ‘if there really was a Santa Claus.’ Her letter and his response were published and have become classics. But our Santa isn’t necessarily the metaphoric and mystical Santa Claus that Church wrote about. And, as you will see as we stroll through family pictorial history with ol’ St. Nick, the Luckers, in their own quirky and unique way, sort of embody Santa Claus in the true American way: it is an oddly varied, sometimes-not-all-that-photogenic, what-were-you-thinking sort of rouges gallery of holiday tradition. Let’s start at the beginning – or at least, my beginning. 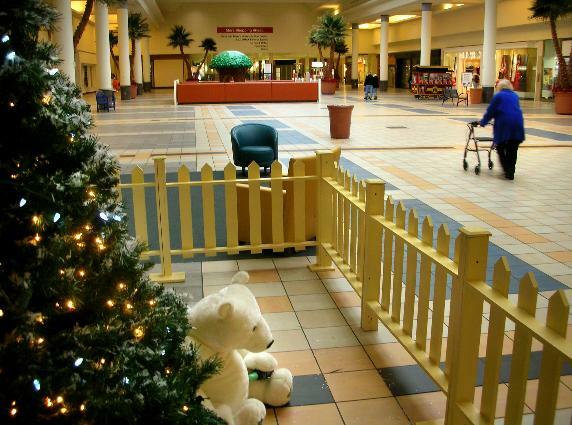 Back when I was a lad, Santa was found waiting in big Dayton’s department store in downtown Minneapolis. My mom, your great-grandma, trotted me down to the store ever year for their annual Christmas displays and obligatory picture. As the photographic evidence shows, I was a fairly stylin’ dude for the time (the early 1960’s) and that the representative Santa’s were a rather eclectic bunch. The first guy appears to be in the process of passing out; I believe the guy in the middle has just directed a kid to smile for approximately the 3,000th time that day, and the guy on the right appears to be hung over. 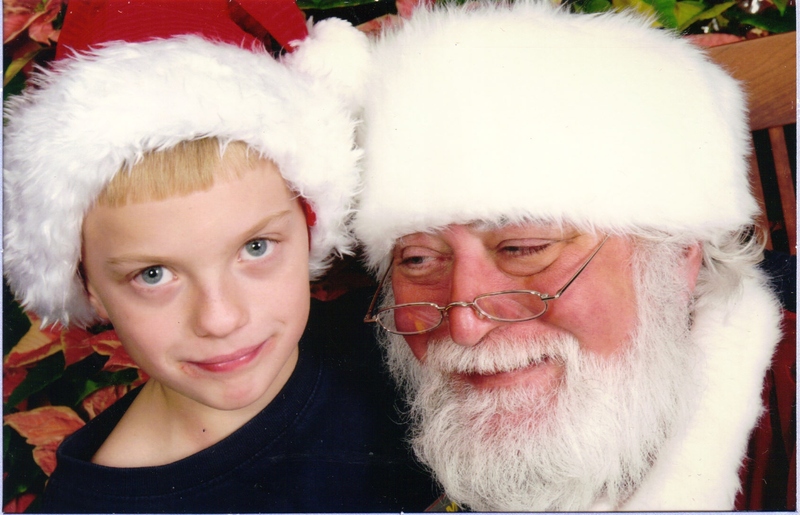 Fortunately, my mom was not obsessed with the whole pictures-with-Santa-every-year thing, so this is about all there is of my youthful history with Kris Kringle. By the time I was in junior high, we lived in Denver, and my dad worked at KWGN television as a film editor. A community theatre veteran and all-around-ham, he was eventually recruited to portray Santa once a year for a daily live, hour-long local program the station did called ‘Denver Now.’ The host of the show was a wonderful woman named Beverly Martinez, and every year she devoted a show to a ‘giving for the holidays’ theme and would have Santa as a guest along with children of KWGN staffers, and at the end of the show he would give a little toy to each of the kids. 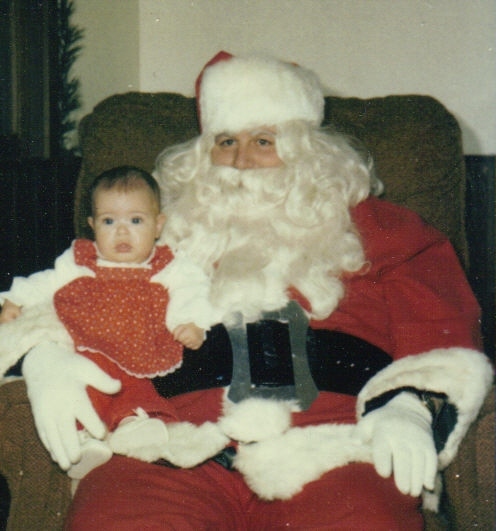 Beverly said many times that once she got my dad to be Santa, she would never consider anyone else for that yearly job. I still have a couple of the wind-up toys he gave away one year, Felix. I’ll let you play with them when you’re a bit older. I also have the wrist band of jingle bells he wore during those broadcasts, and I get them out each December. You’ll get to hear them very soon. 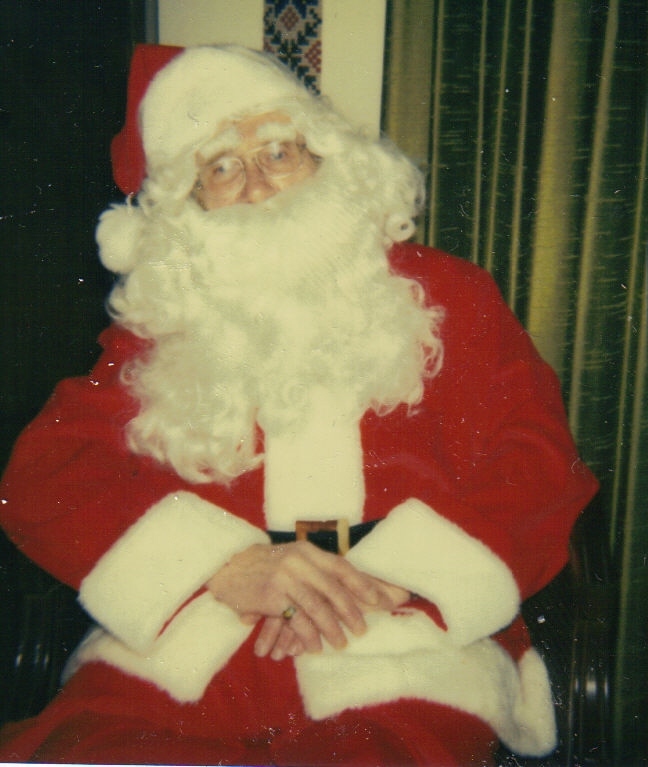 My dad did the Santa gig for ‘Denver Now’ his last six or seven years at the station before retiring, and it was always a high point of the season for him – one year in particular. The winter I was a junior in high school, our drama department at South High was doing a children’s theatre production of ‘Sesame Street’ and somehow Beverly got wind of it. She asked if a couple of costumed characters from our production could come and be on the Christmas show along with Santa. Allen Schultz, the guy who played Cookie Monster, and me as Oscar the Grouch, were the only two able to make the live broadcast. It was great publicity for our production, and a great experience for all of us. Allen recalled the whole episode fondly as a high-point of high school even at our twenty-year class reunion, and as for me, it was the only time I ever appeared ‘on stage’ with my dad. It was a great, goofy morning. For so many reasons: Thanks, Beverly! As time goes by, Santa makes other sporadic and sometimes curious appearances in our Lucker history. Your mom got her turn on the big guy’s lap a few times; case in point to the right. I’m sure your mom has other Santa-related pics to share, as she is a big aficionado of all things Christmas, though with your recent arrival, maybe that’s less of a focus this December. Next year, you’ll have just turned one? Oh, baby! It’ll be something, I’m sure. You’ll love it. There is a Santa and your mom episode that while, not visually represented here, deserves some mention. 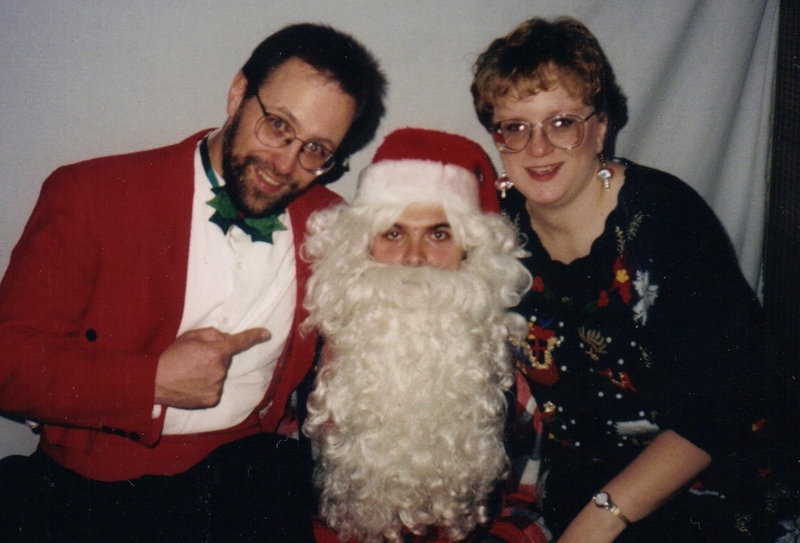 For four years I played Santa on WYRQ radio in Little Falls, Minnesota. The station sponsored an annual ‘Letters to Santa’ promotion in which kids dropped off their letters at various businesses while trying to win a new bike, and then we read those letters on-the-air every weeknight; an elf and an announcer in studio reading the letters, Santa supplying commentary and occasional ho-ho-ho’s over the phone, ostensibly from his North Pole workshop, being the basic premise. ‘Irreverent’ grossly understates our take on the whole Santa and Elf mystique. Egged on and set up for gags by the extraordinarily talented and extremely demented Mr. Dupre as high-pitched Sparky, my radio turn as Santa was described as everything from ‘overly caffeinated’ to ‘manic.’ Al the while, your mother was usually right there in the living room, observing her father warily, as he sat in his easy chair, screaming Santa and elf jokes wildly into the telephone, while periodically jangling a large set of gold jingle bells and yelling “HO-HO-HO!!! ” to punctuate a punch line. 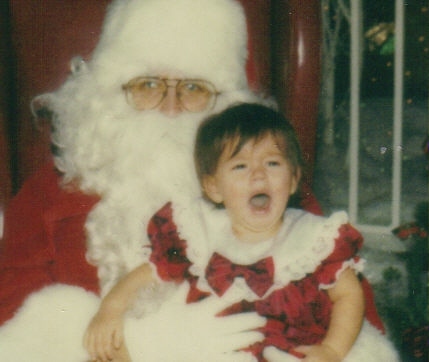 Any rather, uhh, skewed ideas she has about the whole Santa Claus experience likely stems from that pre-school through kindergarten holiday era of hers. While there is some photographic evidence of this yearly escapade somewhere, it is the audio that is most telling, and probably a little much for your young ears. Someday, lad, someday. We still have the Pinocchio hat in one of the plastic Christmas tubs in the attic. You’ll get a chance to wear it someday, if you want. It goes nicely with my dad’s wristband of jingle bells. Speaking of those jingle bells, here’s a little secret I’ll share just with you, Felix: the elasticity has long since been wrung out of those bells, but I sometimes carry them in my pocket during December, professing ignorance of the source when someone says, “Does anybody else hear jingle bells ringing somewhere?” Usually, it’s only someone I happen to be walking close to who can hear them, muffled as they are in my pocket, and others in the vicinity react with puzzlement at the question. It’s just my little tick to slyly spread some holiday cheer. 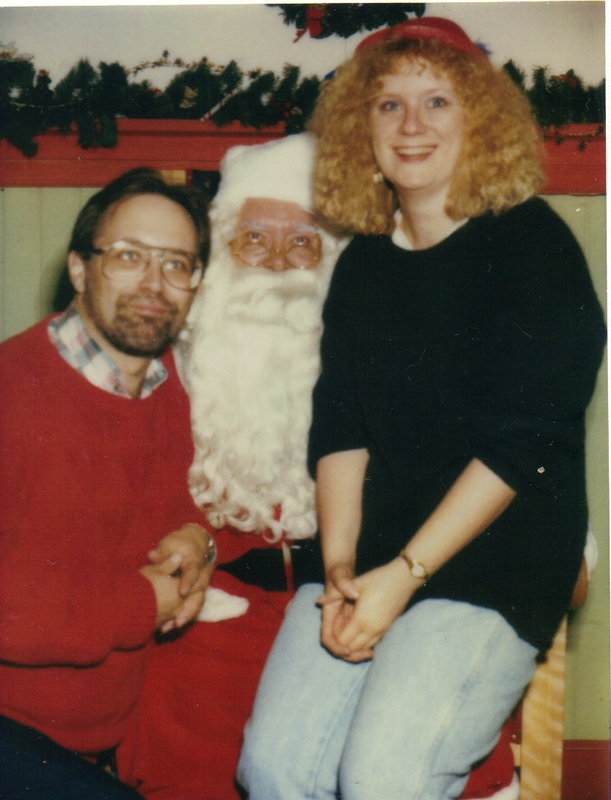 When Amy and I were first married, Santa popped up in some different situations. For instance, he made an appearance (in much different ways and personas) at two Christmas parties we threw at our house in Minneapolis. As I mentioned, Santa is all about diversity. Santa Kenny was a friend and co-worker. He was stationed on our front porch and greeted people as they arrived, bringing a very hip, urban flavor to the proceedings. Once all the guests had arrived, Santa Kenny moved into the living room and sat in our big, green Adirondack chair, and people spent the evening their conversing and having their pictures taken with Santa. 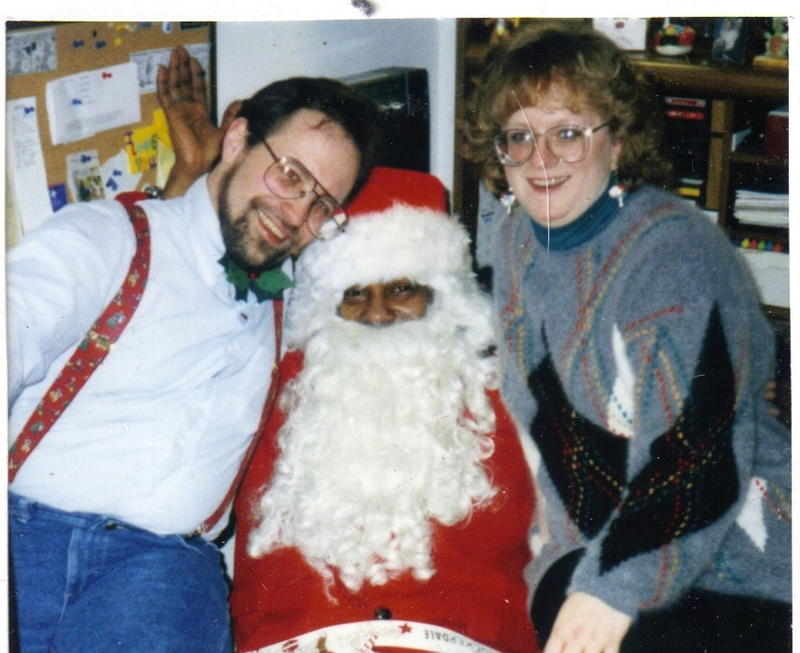 Many of our friends had never met a black Santa before. After that memorable night, they had the pictures to prove that they had. 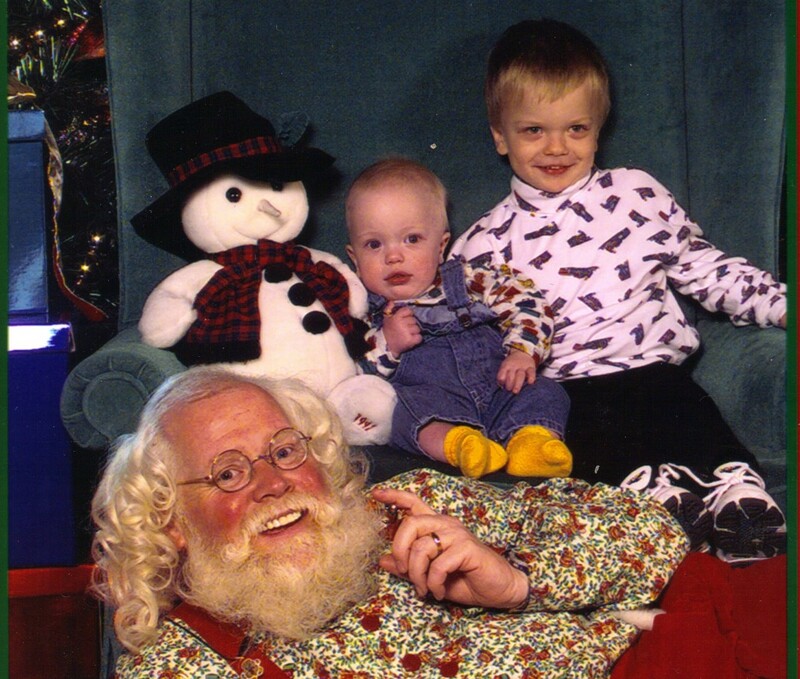 The following year, Santa Don, my cousin’s son, took over greeting and picture-taking duties. A younger, more suburban take on St. Nick, Santa Don held his own from the same chair, dispensing holiday gift ideas and jokes that many of the older (over thirty) guests didn’t get. 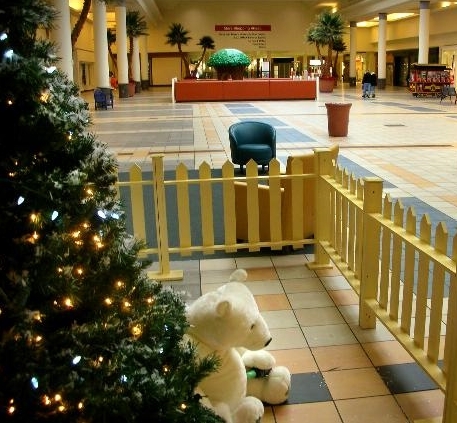 I played the mall Santa role for one holiday shopping season, and that was plenty. 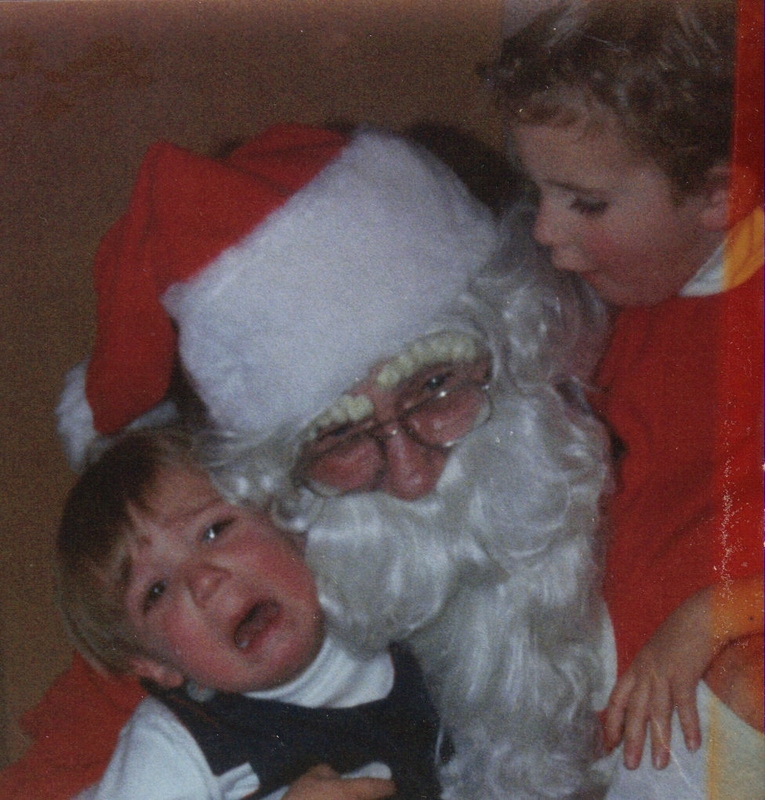 Not being the prototypical Santa physically, I sported lots of make-ya-sweat foam rubber underneath the red suit, and nearly fried my vocal chords trying to keep my voice in the lower octaves for hours on end. But it was good money, a lot of fun, and I cherish the experience. 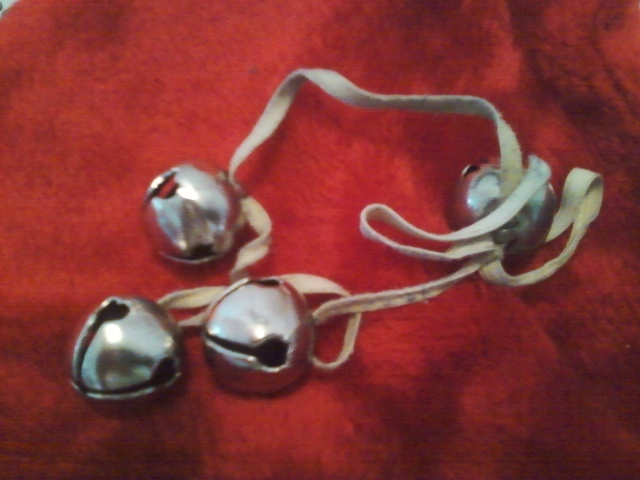 I even got to wear my dad’s wrist bells. And I got to keep the wig and beard. 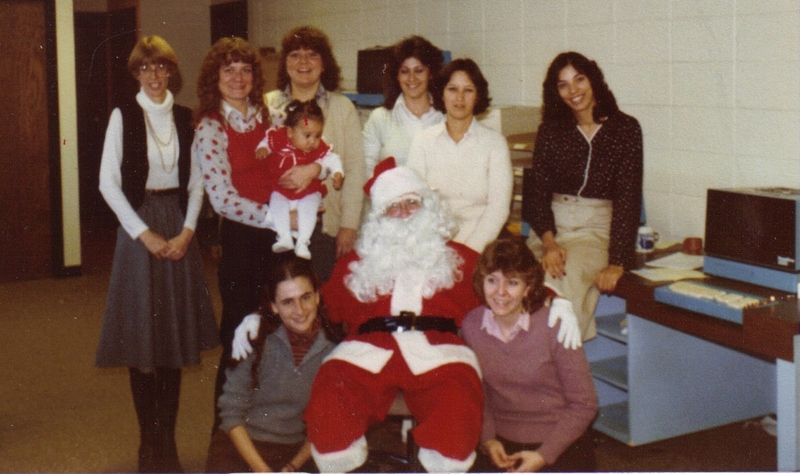 The shot on the left is ‘Denver Now’ Santa in 1981, making his yearly post-broadcast visit to the KWGN office staff. 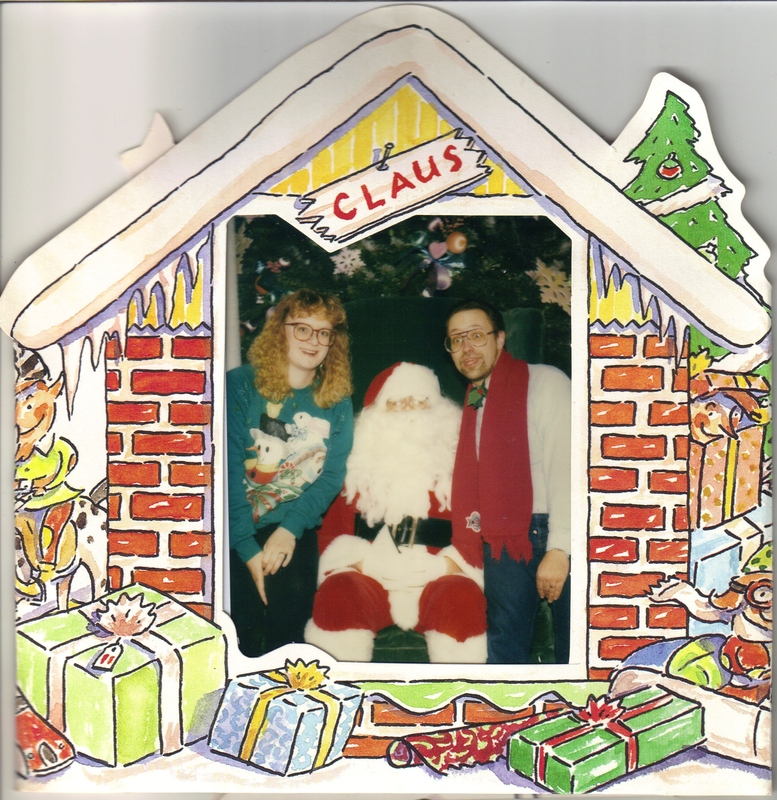 On the right is Brookdale Mall Santa with number-one-elf Marji in 1996. Interestingly, Santa appears to be, in his various incarnations, something of a ladies man. And for future reference, Felix, girls simply love a guy in uni form. 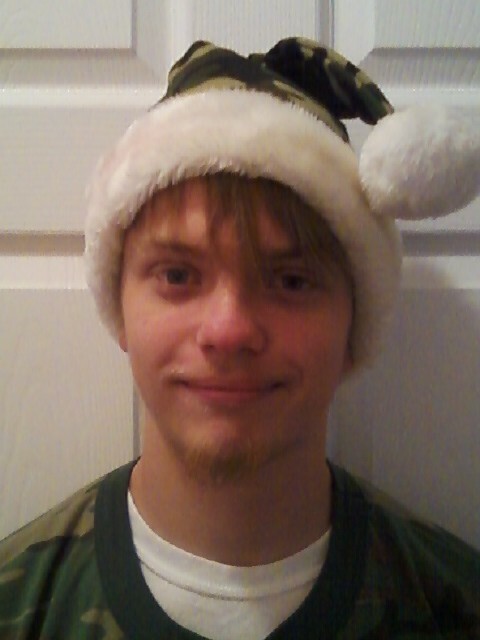 Yeah, uncle Will is wearing a camouflage Santa hat. 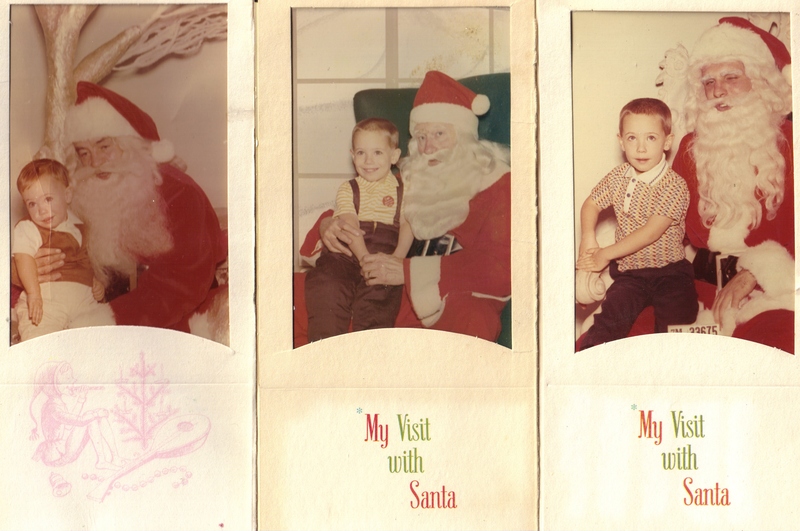 Finally, here is a side-by-side of my dad and I in our respective Santa roles, some fifteen years apart. Notice any family resemblance? Maybe someday you or maybe even Will or Sam will add another holiday mug shot to the gallery. Felix, I of course have no idea when or where you will encounter Jolly Old St.Nick in your life, but I’m pretty confident you’ll make each other’s acquaintance in some form or another. Santa is a good friend to have, embodying as he does, a lot of the goodness in the world, and a lot of the magic that is childhood. He’s a pretty cool dude. And don’t get all hung up on all that one-and-only stuff; as you can see from all the above, there is no such thing as a singular Santa. Santa is wherever you need him to be, whenever you need him. And a few laughs along the way.